I recently purchased a Xerox color printer, (the Phaser 6280, which I love, by the way). As part of the warranty registration process I am now on Xerox’s email list. I just received this e-newsletter that had me cringing at the contradictory advice given. More free business flyer templates. With our new professionally designed business flyers, there are now over 20 free designs you can use to look your best in print. It’s really hard to stand out from the crowd, when you use a free template. The worst case scenario is that your competition is actually using the same template as you. This is more common than you think. If you are the travel business you choose the travel theme. If you are a florist, you choose the floral theme. Unfortunately, that’s what everyone else is doing, too. What differentiates you from your competition? Is it that you sell flowers? I don’t think so. Rather it’s your unique way of combining different types of flowers, or your incredibly fast delivery, or your guarantee that the bouquet will last for 5 days, etc. The themes presented in templates—whether they be printed brochures templates or web site templates always focus on the lowest common denominator. They can’t be distinct enough to make you stand apart from others in the same field. 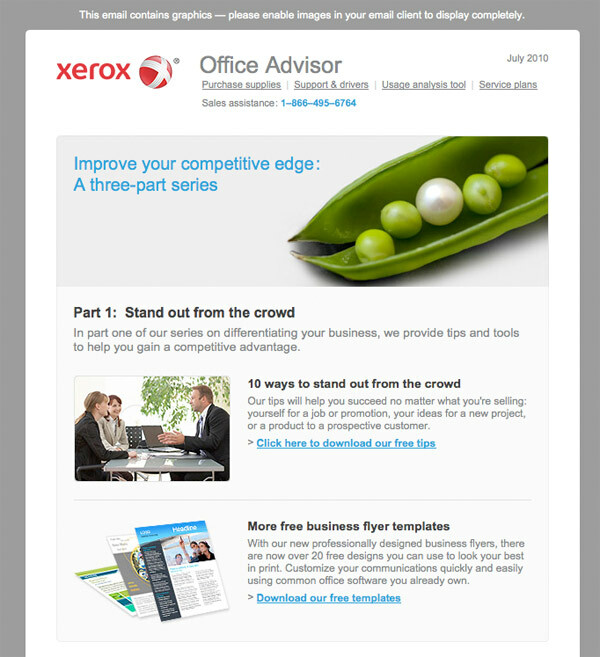 As Xerox realizes, you need to stand apart from the crowd if you wish to recognizable, well-known and trusted. A distinct brand identity can do that for you in a way that no stock template can.